Google Chrome Operating System will be released in the second half of 2010. Since all OSs predate the web, Google is re-thinking what an operating system should be. They aim to create a secure OS without virus and malware issues. The OS will focus on speed and simplicity. It will boot quickly, have a minimal interface, and be ideal for people who spend the majority of their time on the web. There are rumors that Intel is involved. Initially, Chrome OS will be available on AMD and Atom-based netbooks, with desktop and laptop installations arriving later. Chrome OS hardware vendors include Acer, ASUS, Hewlett-Packard, Lenovo, Qualcomm, Texas Instruments, and Toshiba. The OS will be open source and free. Although Google already has the Android operating system, Chrome OS is a separate project. Technically, it will be based around a lightweight Linux kernel and a new windowing system (note: Linux uses the X Window System. Any graphical user interface can be built on top so, unlike Windows, Linux users can choose from GNOME, KDE, Xfce or any other desktop environment.) Google’s Chrome browser will be the primary application and I suspect Google Gears will provide offline functionality. Cloud-based operating systems are not a new idea. Netscape proposed the possibility in the late 1990s and, even though it was pure vaporware, it was one of the primary reasons Microsoft fought and won the first browser war. Even today, Google is behind similar projects such as Moblin and Jolicloud. Although the Chrome OS announcement has an element of marketing hype, there is good reason to believe Google are serious. Controlling the browser allows Google to direct users to their online applications. GMail, Docs, and Wave could receive a registration boost that increases advertising revenues and user lock-in. Is it possible to develop a new OS within one year? OS development is tough; Microsoft and Apple have been working on them for almost 30 years and they still make mistakes. Using Linux could help, but even the Chrome browser is not complete on that OS. Although the netbook market is growing, it is still small and Microsoft has a 90% share. Quick-booting Linux-based netbooks have been available from the start, but the majority of consumers still want Windows. Netbooks remain uncommon in important corporate sector and most businesses rely on desktop applications. Although users are happy to surf, shop, and socialize online, few people do real work in the cloud. Could Microsoft compete? Absolutely. Windows 7 is already optimized for netbooks and IE8 is good enough. The company could quickly create a bare-bones version of the OS. If the devices are inexpensive — perhaps under $200 — installing Windows would become commercially impractical. A Google-branded machine might attract users, especially if the hardware is sold as a PDA or an internet device rather than a mini-laptop. Innovative features such as touch-screen navigation could also increase sales. 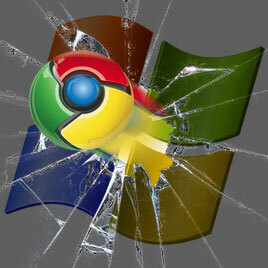 Chrome OS could be provided in addition to Windows. A dual-boot system would allow users to choose which system they wanted on start-up. Alternatively, Chrome OS could be provided on bootable memory cards or USB drives. In the long-term, Google could even investigate the possibility of a lightweight BIOS-based system. Chrome OS will continue to attract massive media speculation until its release (and, yes, that includes SitePoint!) Even if Google gets it right, they face a huge uphill struggle. They’ve had limited success persuading people to switch browsers; expecting them to switch operating system is a far more difficult challenge.